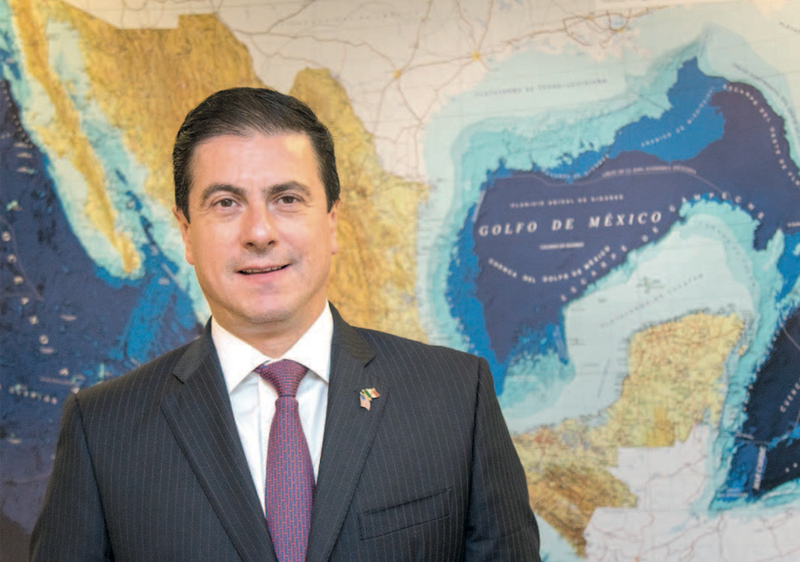 Geronimo Gutierrez is on a mission of service: the challenge to help secure a better future for Mexico and strengthen ties with the United States. “The reality of things is that ever since I was young I’ve always been attracted to public service,” he said. Gutierrez, a Harvard graduate of the prestigious John F. Kennedy School of Government where he earned a master’s degree in public administration, has held various positions alongside Mexican government officials and presidents such as Vicente Fox and Enrique Pena Nieto, Mexico’s current president. Some of Gutierrez’s experiences have been marked by events that shaped global politics and the relations between the United States and Mexico. He points out to the Sept. 11 terror attacks as one such example. “I was working in the economic secretary,” said Gutierrez whose political experience spans over 25 years. “I felt there was a global change, an adjustment to the politics in Mexico and the United States.” At the time he had recently completed his role as sub-secretary for North America. Traveling abroad and other homeland security matters affected the economy of both neighboring countries due to flight restrictions and lower travel and tourism. Gutierrez credits such socio-economic changes and others he experienced earlier in his work and educational career that shaped his ability to think critically and aide his government in foreign affairs that affected his country locally. A native of Mexico City, Gutierrez held various roles in public service departments such as national security, finance, and trade. His roles have included deputy secretary for government and homeland security and other roles as Under Secretary. Gutierrez’s political experience continues recording its own history as he serves during a time of tense relations between the United States and Mexico. Plans of building a wall stretching along the United States-Mexico border, deportations, Deferred Action for Childhood Arrivals (DACA) and other topics have continuously surfaced in the media and lead many to question whether both countries can reach agreements regarding the border they share and other social issues causing tension between them. “We have to process the differences with the Trump administration,” he said. “We must have a border that’s not an origin of tension. We have to create diplomacy today in real time. It’s in the best interest of the United States and Mexico to have good relations.” He also said he envisions Mexico over the next century boasting more mobility so people from both sides of the border can work, study and enjoy their experiences there. Fluent in three languages: Spanish, French, and English, Gutierrez developed strong relations with important figures of Mexico’s government, allowing him to learn each time and acquire leadership abilities in the political arena with invitations to participate in notable activities. One such opportunity was when President Felipe Calderon invited him to be secretary of Latin America. He was also asked by former president Vicente Fox to help design the first budget of his presidency. As Gutierrez continues moving forward in his role as ambassador, a position he has held since January of 2017, he envisions a long-term political career: one that he says requires perseverance, which he says his academic preparation helped nourish. “I’m grateful for having people who helped me, people who believed in me, that gave me opportunities and opened the door,” he said. “That’s fundamental and I’ll always be thankful even if we’ve found ourselves in different points of debate.